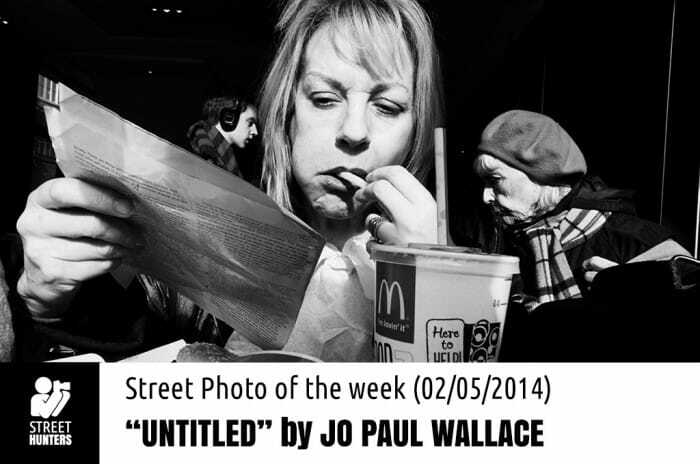 Jo Paul Wallace is a Street Photographer that works in London, the UK. 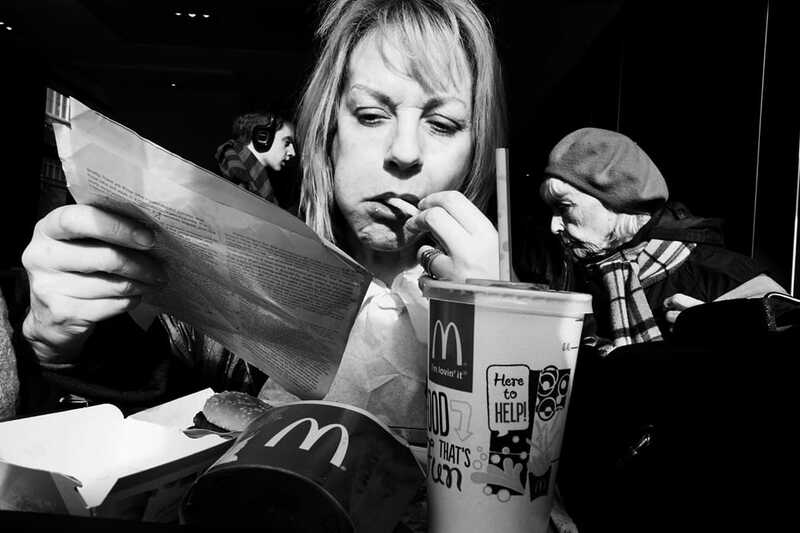 Originating from the world of documentary photography, Jo Wallace has evolved into a bold and confident Street Photographer that likes to get close, very close and also has an eye for the unique! His images are smart and almost always include one or more awesome characters caught while doing some weird facial expression or gesture! A few years back, Jo joined the Street Photography Now Project on Flickr and through the valuable feedback he got through that group he evolved from a documentary photographer, photographing realistically to a surrealist. As for his gear, he shoots a full frame digital camera and uses 17mm to get really, really close! He started with a 28mm, then moved to a 24mm and a 17mm, depending on what he wants to achieve. “Untitled” by Jo Paul Wallace. This image has been used with the consent of the original artist. This is a photo that I immediately stopped to study! I was going through Jo’s photostream on Flickr and I just froze when I saw this one. I enlarged it, zoomed in and looked at the characters. “What’s going on here?” I asked myself. “Is this a Photoshop collage composition?”… Minutes went by and my eyes begun to work the image from a different perspective. I then understood (I hope) that this is the photo of a woman eating her french fries in front of window, sun on her face, totally unaware she is being photographed while munching and at the same time, to other people walking into the beam of light that is splashing on to the woman’s face, behind her, on different levels of depth from the camera lens and moving in opposite directions. I realised that I have looked at the photo so intently, because I suddenly felt my eyes go dry. I hadn’t blinked! Naturally, the next thought I had was “This is going to be Street Photo of the week on the website” and here it is folks! Enjoy it! Thank you Jo Paul Wallace! What a great photo! Definitely deserves Photo of the week! Congratulations Jo Paul Wallace!